When to Buy Madison Square Garden (MSG)? 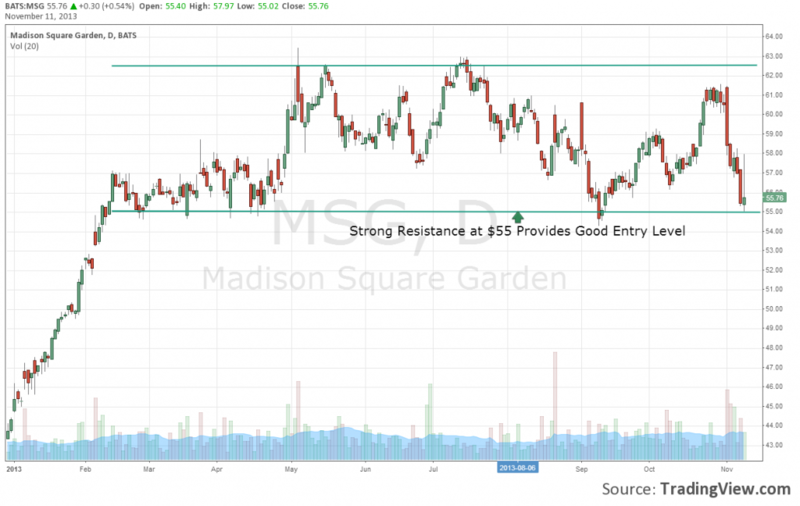 Madison Square Garden (MSG) is one of our top picks at the moment based on our belief that the sum of their parts is worth far more than the market is currently valuing the company. Taking a glance at their chart, they appear to be near an optimal entry level for the long term. Over the past 9 months, MSG shares have failed to trade meaningfully below $55, only closing beneath that number by a few cents on two occasions. Despite a very positive earnings report, the completion of the Madison Square Garden arena renovation project, and the opening of the NBA & NHL seasons in the past few weeks, MSG is trading at a 3% discount from our first recommendation to buy them. Currently at $55.75, Madison Square Garden is very near the ideal time to enter a position from a technical perspective.